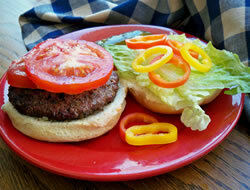 Worcestershire Ground Black Pepper Blend is the black pepper to reach for to season burgers just right. 1. Mix ground beef and seasonings in medium bowl until well blended. Shape into 4 patties. 2. Grill, broil or pan-fry 4 to 6 minutes per side or until burgers are cooked through (internal temperature of 160°F). 3. Serve burgers on toasted rolls. Sprinkle with additional Worcestershire Pepper, if desired. Garnish with desired toppings and condiments.